This author has a gift for selecting the right words at the right time. Thiel Clay is a young man who has a crooked face and a cripple’s body, but in the words of the author, “Nature had given Thiel an ugly outer shell and a fine inner core.” He lived with his poor family and spent his days working on Squire Turo’s farm. He dearly loves his grandmother, Narn. One day his life dramatically changes when she passes away and she leaves him a box with a letter and a key inside. Thiel cannot read or write; he takes the letter to a neighbor, Mr. Bunmet. The young man is astonished to learn that his grandmother left forty pieces of the realm in trust at the home of Justice Thwaite in the city of Goneton. Thiel is afraid; he has never been far from his village. Now to ponder a trip on foot to the city is an unthinkable task, but his kindly neighbor encourages him to be man and claim his fortune. Thiel does not tell his parents, Sara and Ed, because he instinctively knows that they will claim that he is a simpleton and take it away from him. 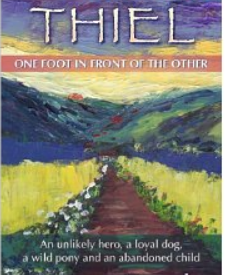 So Thiel carefully constructs a plan for his journey with his faithful dog, Heap. When they reach the house of Farmer Weeks, they are welcomed with food and warmth. More importantly he supplies Thiel with a warm coat and a map indicating a traveling plan for the journey. He volunteered to take care of Heap, while he was gone. Thiel soon became homesick and scared as he reached the city outskirts and the terrifying crowds of noisy people. After much travail, Thiel finds the home of the Justice where he gets another surprise, he has also inherited the key to an estate far away in Minark. So begins another difficult journey…. Pearl uses personification effectively to describe nature and the medieval-like surroundings of Thiel and his time. The characters are well developed. Thiel is a character you want to embrace and hug. The contrast between city and country and modern versus traditional is played out well. Looking forward to reading more of this series. Suitable for children in middle grades and young adults. Mature readers will find it quite entertaining as well.